Third party candidate to split GOP? Well, it sounds like fun…but probably in a death wish kind of way if you are a Republican opposed to anyone the Dems have to offer. A third party candidate, that is. Author Warren ThrockmortonPosted on September 30, 2007 Categories abortion, politics2 Comments on Third party candidate to split GOP? Author Warren ThrockmortonPosted on September 28, 2007 Categories Professional issues, Relationships, sexual identity, sexual orientation18 Comments on Grey and gay? Just days after asserting that there are no homosexuals in Iran, Iranian President Mahmoud Ahmadinejad today invited United Nations inspectors into his country to search for homosexuals. While some senior U.S. diplomats expressed skepticism about the Iranian president’s offer to allow U.N. inspectors to search his country for homosexuals, Mr. Ahmadinejad attempted to silence the skeptics by permitting the use of “advanced gaydar technology” as part of the proposed inspections. “In Iran we have the most advanced gaydar in the world and we are prepared to share it with you,” he said. In the immediate aftermath of Mr. Ahmadinejad’s speech, it was unclear as to who would lead the U.N.’s inspection efforts, but most diplomats assumed that the task would fall to Mohamed ElBaradei, head of the International Atomic Energy Agency (IAEA). 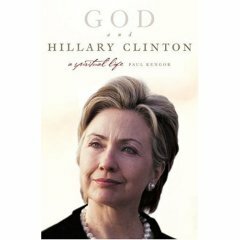 In light of the attention given to Paul Kengor’s new book, God and Hillary Clinton: A Spiritual Life, I asked Paul some questions to go a little deeper into topics of interest to readers. Of course, the fullest treatment of these issues comes from the book, but Paul here provides more depth on the reports of “seances” and her views on abortion and homosexuality. Throckmorton: Many are interested in the spiritual experiences with Jean Houston. Would you characterize her conversations with Eleanor Roosevelt as resulting from a seance? Kengor: No, no, not as a seance. It has been reported that way, but that’s not what I say in the book. I note very carefully in the book that these sessions, which were indeed very strange, were described by Hillary’s critics as “seances,” but that they did not seem to be quite that weird. Now, that said, they were definitely bizarre and far more out-of-line than anything First Lady Nancy Reagan did with her astrologer in the 1980s. Let me explain what was happening: She brought in a kind of spiritual adviser named Jean Houston, who worked with Hillary in these sort of spiritual-psychological-emotional sessions where Hillary “connected,” or “conversed” in a way, with deceased historical figures, namely Eleanor Roosevelt. Bob Woodward actually first reported this in his book in 1996. Mrs. Clinton did not deny the reports, and neither did her staff. Once the revelations became public, she tried to joke about them and move on, clearly embarrassed, especially politically. Now, aside from a “séance,” some pundits ridiculed this as “channeling”—allegations that the first lady and her staff vehemently denied. Yet, these suspicions were not totally unmerited. The work of Houston and her husband, Robert E. L. Masters, went well beyond the typical goofy New Age stuff. Houston and Masters did channeling in the past. Masters had his patients channel the Egyptian god Sekhmet. In her book, Public Like a Frog: Entering the Lives of Three Great Americans, Houston introduced three individuals that she said were available to be contacted through a trance or altered state of consciousness: Thomas Jefferson, Emily Dickenson, and Helen Keller. Somewhere along the line, Eleanor Roosevelt also presumably made herself available. Hillary was not, as far as we know, levitating above a table in the White House. Nonetheless, what Hillary was involved with had the potential to be dangerous, and is widely condemned by the vast majority of Protestant denominations. After this, for whatever reason, whether spiritual or political or both, Hillary got back on track to more conventional Christianity. The United Methodist Church, her denomination, came to the rescue with an offer of a major speaking engagement at the annual conference in April 1996. She then gave a major speech on her more conventional religious upbringing and beliefs. Throckmorton: You mentioned that Jean Houston felt Hillary was enduring some kind of “female crucifixion.” What does this mean and what was Mrs. Clinton’s reaction to their characterization? Kengor: According to Bob Woodward, Houston had come to the grandiose conclusion that Hillary was personally carrying the burden of 5,000 years of women being subservient to men—nearly the entire history of female subservience had been tossed upon the back of Hillary Rodham Clinton. This was her cross to bear. Now, affirmed Houston, history was at a turning point, on the brink of genuine gender equality, and it was Hillary alone who could turn the tide—another Joan of Arc. Houston reportedly told Hillary that, next to Joan of Arc, she was there on the front line as arguably the most pivotal woman in all of human history. But she was a victim, a sufferer of bitter, unjustified personal attack; she was, said Houston, like Mozart, history’s greatest composer, but with his hands cut off. Woodward says that although Houston herself did not articulate the image, “she felt that Hillary was going through a female crucifixion.” Nonetheless, said Woodward, Houston told Hillary she would prevail. She must persevere, as the new possibilities for the world’s women were too much for her to cast aside. Apparently, Houston helped Hillary identify a couple of means for fulfilling her global, millennial potential: Hillary should proceed with the book on childcare that had been germinating, and she should attend that U.N. conference on women in early September 1995, specifically, the Fourth World Conference on Women in—of all places—Beijing, to be held September 4-15. There, of course, feminists hoped to save the world by winning for women a global right to legally abort children. Throckmorton: Does Mrs. Clinton ever grapple with how she can see the face of Jesus in little children and then defend abortion rights so strenuously? From your research, how does she reconcile the two positions? Kengor: She is very careful to avoid addressing questions like “does life begin at conception?” or “what would Jesus think of abortion?” She shrewdly recognizes that this is a minefield. Unlike pro-choice liberals like John Kerry, she seems smart enough to realize that once you acknowledge the humanity of the unborn child, and particularly from the moment of conception, then it becomes very troublesome to argue for the right to take that life. She generally avoids publicly trying to reconcile the two. Of course, we must keep in mind that her denomination, the United Methodist Church, supports legal abortion and in fact is a member of the Religious Coalition for Reproductive Choice. So, she points to her denomination for guidance on this matter and, lo and behold, gets backing in being “pro-choice.” The minister at her Washington, DC church, one of the top Methodist leaders in the nation, is pro-choice. Why wouldn’t he be? The UMC leadership is pro-choice, as was, by the way, a fellow Methodist named Harry Blackmun, author of Roe v. Wade, who, incidentally, was invited to take the pulpit at Hillary’s church one day in 1995. Throckmorton: Does Mrs. Clinton’s religiously based opposition to gay marriage carry over to her views regarding civil unions? Did your research turn up anything on Mrs. Clinton’s religious views regarding the morality of homosexual behavior? Kengor: This is a very interesting issue. She has traditionally been against gay marriage, citing the Bible and the Biblical tradition. She defends the Defense of Marriage Act passed by the Republican Congress and her husband. On the other hand, she continues to become ever more embracing of gay rights. This is one issue where she is obviously increasingly ambivalent, and I could see her eventually changing on this one if it helped her politically. Throckmorton: Do you think Mrs. Clinton will be able to garner any high level evangelical endorsements? If so, who might be inclined to support her? Kengor: Only from liberal evangelicals like Jim Wallis and Tony Campolo, not from conservatives. Look, I try to be as fair and charitable to her as possible in this book, even saying from literally the very first pages that she undoubtedly appears to be a Christian and is truly a lifelong committed Methodist, albeit a very liberal Christian, a Religious Left Christian. She is also a Christian who in my view is tragically wrong and misguided on abortion. That said, if you’re a conservative evangelical and someone who is a deeply pro-life Christian, you are almost certainly going to be repulsed by her stridency on abortion. She is to the left of everyone on the abortion issue. I would not expect any high-level endorsements from conservative evangelicals. Can Hillary Clinton reach the religious right? In today’s Washington Post, Michael Gerson has a look at the improbable question – Can She (Hillary Clinton) Reach Religious Voters? And it is hard to imagine that these voters will be successfully courted by the most comprehensively pro-choice presidential candidate in American history. That might change under one circumstance: if Rudy Giuliani were the Republican nominee. Whatever Giuliani promised concerning the appointment of conservative judges, a pro-choice Republican nominee would blur the contrast between the parties on abortion. And between two pro-choice options, a larger number of religious voters might support the one with a stronger emphasis on poverty — because, after all, Jesus did have a lot to say about how we treat the poor. Author Warren ThrockmortonPosted on September 26, 2007 Categories abortion, politics, Professional issues28 Comments on Can Hillary Clinton reach the religious right? The following comes from a More Light Presbyterian newsletter dated May, 1996. It is apparently a copy of what was to be sent to More Light supporters, either via email or print or both. In light of our discussions about the Jones and Yarhouse study, bias, and the recruitment of participants, I thought it would provide context to include the call for participants used by Shidlo and Schroeder for their study of harm from change therapies. This was sent to numerous gay affiliated groups looking for participants. Did you know that counselors, psychologists and psychiatrists still attempt to treat **homosexuality** as a **disorder**? Reaction has been swift to the Jones and Yarhouse study. Many on this blog and elsewhere are questioning the ability of Jones and Yarhouse to fairly present their data because they are Evangelical Christians reporting on people supplied by Exodus International and funded by Exodus. While I understand the question, I believe that the book and their public presentations make it clear that, from the beginning, they intended to present the results of their prospective study no matter what the results were. And in fact, the results are not glowing endorsements of complete change, thus adding to the credibility of their promise and delivery. Another criticism leveled is that Jones and Yarhouse should take public notice and offense at the misuse of their work. On this point, I have some experience given the concerns over the misuse of my documentary I Do Exist. Clearly, some critics and proponents have gone far afield of this study. Wayne Besen is perhaps the biggest offender, calling the study a “sham” before it was even out. And then an article in today’s Washington Blade quotes Chrisine Robinson as having problems with the study – which she hasn’t read. Sociologist Christine Robinson, a professor at James Madison University who focuses on social control of deviance and sociology of sexualities, said she has two major concerns about the study, which she has not yet read. The first is that some will abuse its findings and the second is the methodology. The study would have been stronger, Robinson said, if it included an independent, in-depth assessment of the therapeutic methods themselves. She notes one limitation already mentioned by the authors (and addressed in the book) and then faults the study somehow for how others will use it. And indeed it will be cited in a variety of ways — some misleading. For instance, Lifesite News wrote that Christian counseling helps people leave the “homosexual lifestyle.” Unless you consider Exodus involvement Christian counseling, this is of course incorrect. I suspect other types of spin on both sides will occur. Science has shown us that 96% of people cannot change and along the way, absorb an enormous amount of self-loathing, a lot of confusion, a lot of family conflict, so I know the harm. And then a PFLAG representative misrepresented the study in a replied to a Chicago Tribune article. No one on my blog or anywhere else I can find called on Shidlo and Schroeder to chastise the PFLAG speaker, or Alicia Salzer for misreprenting their work. Why not? Changing Sexual Orientation: Does Counseling Work? If you have taken part in counseling or psychotherapy that has attempted to change your homosexuality please give us a call. We are conducting a national study of individuals who have gone through such counseling. Did it work? Did it fail? We want to know how it affected you. For a confidential interview please call: Dr. Michael Schroeder and Dr. Ariel Shidlo at 1.800.592.9815 or 212.886.3770. You can also E-mail us at therastudy@aol.com, or visit our Web site at http://www.jasperweb.com/therastudy. Any quantification of their participants into categories is pointless because the sample was clearly non-representative and the study not prospective. Jones and Yarhouse’s made a good effort at representativeness (although not completely successful) and their study was prospective. Shidlo and Schroeder were anticipating and seeking their results in the call for participants. So if critics want to discount Jones and Yarhouse based on perceptions of bias and limitations, then Shidlo and Schroeder must go too. And when advocates refer to their study improperly, I expect us all to call on Drs. Shidlo and Schroeder to take them on. Citizen Link is reporting that tomorrow night’s 20/20 will air a segment about Focus on the Family’s Love Won Out. Filmed in Omaha, the theme will be difficult choices. I will be curious about what themes are sounded by the staff. Past LWO programs have focused on reparative theories of causation and change. I wonder what the emphasis is now in the program and how the 20/20 folks will frame it all. 20/20 runs from 9pm to 11pm est. Lord willing, I’ll be watching. UPDATE: 9/21/07 – Well, it wasn’t must-see TV as far as I am concerned. Old news about Paulk, no follow up on his life now. Drescher is the only professional involved, insinuations about money being the (real) motive behind ex-gay stuff, etc. The interview with James Serra was interesting and certainly not asserting much of anything about change. The 2 out of 9 follow up on LIA was new but even then, Mr. Serra is not straight.